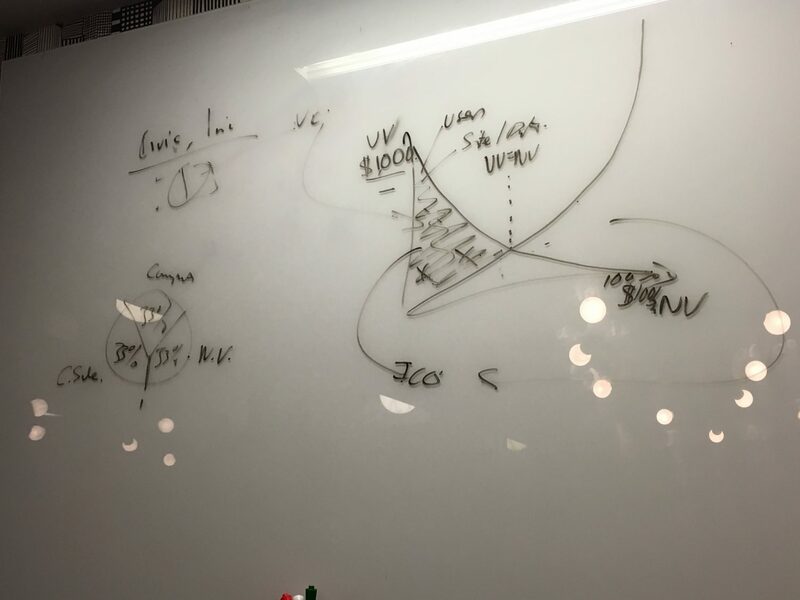 Up against a white board, Vinny Lingham makes a convincing case for initial coin offerings (ICOs). Darting and drawing various charts and lines, Lingham positions the nascent concept – through which entrepreneurs sell blockchain-linked data that will form an underlying part of an in-development distributed service – as one that will change the world. Lingham argues that ICOs, while today criticized for their relative newness and lack of legal framework, have given entrepreneurs the ability to solve a key problem. Namely, how to fund an idea before the point at which outside capital could acquire new users that enable the company to develop toward a successful exit. It’s perhaps this enthusiasm that is leading Lingham to offer a token that will enable users to buy into the network effect he wants to create with his blockchain identity startup Civic, founded in 2016 as a way to tackle problems relating to identity theft, but that has since expanded into online verification. Lingham explained that in order to grow, Civic will need to turn its service – which enables users to prove personal information to websites – into a kind of marketplace where consumers and businesses are able to exchange and monetize this kind of data. Lingham is now working with partners to launch the crowdsale, scheduled for the first week of June. Currently, he’s engaging in pre-sales with minimum limits for big buyers. Though the mechanisms of the token sale are still being finalized, users will buy an ethereum token that will serve as a “pre-token” to be exchanged for another token, based on the bitcoin blockchain, later on. Why go through this process? Lingham is articulate on the value proposition, arguing Civic is using the cryptographic tokens to empower early adopters to evangelize for the network. There’s also the unique nature of blockchain networks. Over time, he projects that the increase in value derived from launching a successful token could become a “war chest” that powers user acquisition. Distributed ledger startup Ripple, for example, holds billions in its native cryptocurrency, XRP, and plans to sell these tokens selectively over time to promote its growth. For Lingham, capital is crucial as he wants to enroll banks and consumers into a new kind of identity marketplace, one where users could demand value for their data from companies, and companies in turn could gain an additional revenue stream by selling the verification of the data that they’ve acquired in such exchanges. Potentially, he envisions how such a system could enable banks to make KYC systems a monetizable asset, while keeping the ownership of data in the hands of users. “Let’s say Bank of America, Wells Fargo and Chase, they all know you. And you go to open up an account at Robin Hood, and Robin Hood says, based on your ID, it looks like there’s four providers you trust. It could become a bidding system,” he said. As for why such a system would need a token, Lingham credited traditional problems with value exchange over the internet as yet another supporting factor. Given that the online marketplace involves an array of countries, many with their own national currencies, he foresees needing tokens to facilitate the types of quick exchanges and verifications users and websites would want. Rather than a “fly-by-night” operation, Lingham painted Civic’s ICO as one of the first that open up a network created by an entrepreneur with a successful exit – Lingham sold his mobile gift card startup Gyft to First Data in 2014 – to the wider market. Still, Lingham said he’s not without doubts about the process. “I still challenge people on why they are doing an ICO. For us, we’re solving a distribution problem,” he said. As users benefit from low-cost participation in the data exchange market should they buy in early, Lingham hopes tokens could help the network scale to bitcoin-type levels.